I'm a member of Influenster, and have been for about two years.... I think. 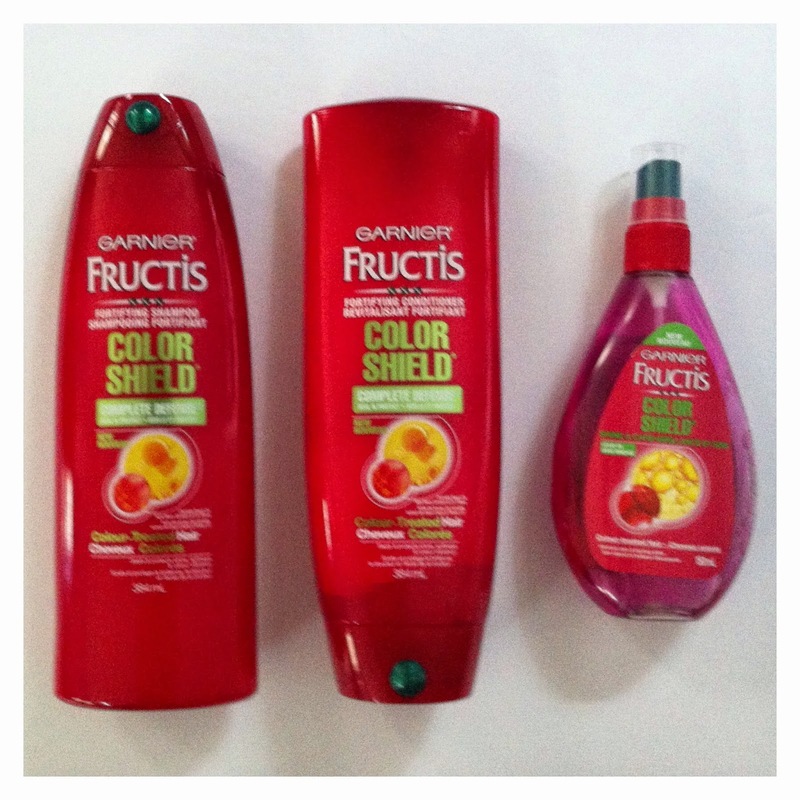 Most recently for their Voxbox program I received a box of FULL SIZE Garnier #ColorShield products. To be more specific, the shampoo, conditioner and the oil (shine spray ). I've heard about the product, but never tried it until Influenster sent it to me. Comes in handy since I dye my naturally red hair an even darker shade of red..... which sometimes fades rather fast. Why do I dye my naturally red hair...? I dye it a darker shade of red, because the finished product just looks more vibrant and I prefer darker red on me over my natural colour. The only problem with having a more vibrant shade of red..... is it fades, and no one wants a dull shade of red. Red hair... where to start, I don't wash it as often which sometimes can lead to it looking greasy. Ugh. Hot water, and styling products ( Hair straightener and blow dryer) definitely threaten how long the desired colour lasts. Color Shields quote : "Want colour that stays bold & brilliant? Seal & protect fresh colour for up to 10 weeks with Color Shield Complete Defense. Protection against heat, water and sun." I've only been using it for a couple of weeks, and I've noticed that it isn't fading as fast as usual. It also doesn't leave my hair feeling weighed down at all, and smells amazing! We'll see how it holds up at the 10 week mark. The Color Shield Shine Shaker says : "Formulated with camelia seed oil and acai berry extract, our unique technology defends freshly coloured hair against heat and nourishes to extend shine and softness." So far I'm loving this shine oil. It smells great as well and definitely adds more shine. So far I'm impressed with this product. I'd say that these products do help with locking my colour in, and keeping it shiny. I'd give them my "shield of approval".